2019 is going to be a big season in the girls' 3200 meters. Plenty of fast times will be chased by some of PA's best. The reigning state champion, Marlee Starliper is back. The Northern junior went 10:17 at Henderson last year and later won the event at states in AAA on a hot day at Shippensburg in 10:25. Expect Starliper to chase after the long-standing 3200 meter state record, which stands at 10:09.2 by Martha White since 1978. Starliper ran 9:58 for a full 2 miles this indoor season, so she is poised to shatter that mark. There are a host of talented 3200 meter returners in AAA. Oakland Catholic's Hannah Schupansky is back after taking fourth last year at states. Wilson's Reagan Underwood (fifth), Warwick's Kate Dickow (seventh), and Cedar Crest's Gwyneth Young (eighth) are among the other medalists back from a year ago. Dickow was the upset 3K state champion from the indoor season, and she'll be looking to carry that momentum into the spring. West Chester East's Allyson Clarke, Dallastown's Emily Schuler, Fox Chapel Area's Grace Sisson, Neshaminy's Kaylee McCullough, and Governor Mifflin's Andrea Miller are among the other talented AAA returners in the event. West Chester Henderson freshman Jenna Mulhern, the AAA state champ from the XC season, should also be a factor. Bethel Park's Emily Carter (second in the 3K at indoor states) should be able to drop a quick 3200 this season as well. In AA, there will be a good battle for the top spot that could come down to the two that made it an exciting start to the day at states last year. 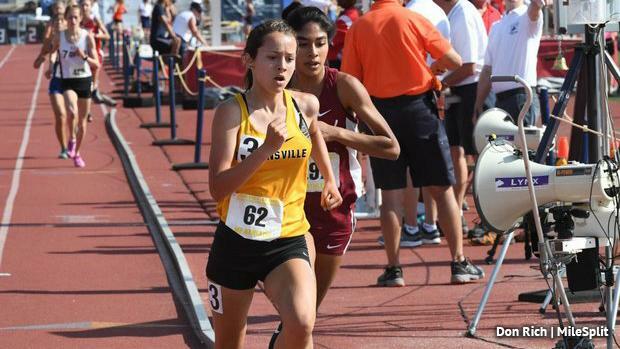 Brownsville's Gionna Quarzo went 10:48 to win the crown last year over Loyalsock's Isabell Sagar. Since then, Sagar became a star on the XC course, winning the 1A state crown. Quarzo is coming off a great indoor season that saw her take third in the 3K at indoor states. Fairview's Maddison Hayes (fourth) and Pine Grove Area's Christina DiFalco (fifth) are the other AA medalists from last year that are back this spring. Quaker Valley's Annie Wicker (11:03 best from last season) is another talented returner back this season.